What can I use my handmade lokta paper for? Use our handmade gift wrap paper for wrapping presents and for your crafting and scrapbooking projects, and our A4 handmade computer printer paper for distinctive notices and greeting cards or for hand-written letters. Our Lokta paper is hand made in Nepal from the bark of lokta bushes, is immensely durable, no trees are destroyed in its making, and it is acid free. Learn how lokta leaf-pattern paper is made and how lokta paper twine is made. ‘I just wanted to let you know that I received the paper and samples I ordered. Needless to say I am delighted with the prompt and attentive service, let alone to say how great the paper and samples are. Your website is a pleasure to use and you clearly have a love for the paper you sell.’ Roger Marsh, Grimsby. 'Wow, that was fast. The paper arrived this morning and just what I had hoped for. Thank you so much!' Martha Mawson, Fife. Thank you very much for a wonderful friendly service. At short notice the materials where delivered perfectly packaged and in good time. The quality of the products was as described and we are really pleased. Dorothy Bell, Oxford. 'I received the paper over the weekend. Thank you for sending them with such care, very impressed both with the beautiful paper & the service.' Kate Ormes, Essex. 'Received my order this morning thanks very much. Delighted with the paper and very pleased with the prompt despatch and excellent packaging :-) Wonderful service and product! Many thanks, keep up the good work and will definitely be ordering from Wildpaper again!' Peter Johnston, Newcastle upon Tyne. Pumpkin colour A4 printer paper for Halloween! A4 Indigo printer paper back in stock! 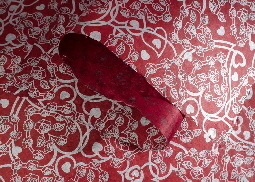 Single Red envelopes for Chinese New Year & Valentines! Handmade Hearts cards for Valentines Day! A4 Dark Walnut back in stock! 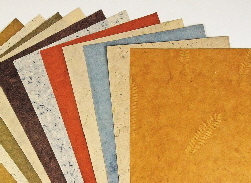 more types of traditional hand marbled paper - check it out! We now sell beautiful Italian Handmade Marbled Paper! 6 new handmade tissue papers in brighter colours! Persian Rose & Cobalt Blue - 2 new coloured artists papers! A4 Tibetan Tea paper is back in stock! A4 Thick Lokta paper back in stock! On an iPhone, smartphone or tablet, pinch and zoom to view at a comfortable size.